David Powell Bossler ended his life journey peacefully on November 28, 2017 in Tempe, Arizona. David (Dave) began blazing his trail on September 29, 1927 in Grantsville, West Virginia, the third son of Robert and Mary (Fisher) Bossler. David grew up in Oil City, PA where he and his two older brothers, Robert and Bert excelled in Boy Scouts, Academics and the fine art of Practical Jokes. This “trio of trouble” remained extremely close throughout adulthood and were together as recently as September to celebrate David’s 90th birthday. David was able to skip his last year of high school, opting to head straight to Allegheny College. He served as a member of the 82nd Airborne for two years and upon discharge, enrolled in The University of Texas at Austin. He was a member of the Delta Tau Delta Fraternity and played in the woodwind section in the UT Longhorn Marching Band. While attending UT-Austin he would hitchhike back and forth between home in Pennsylvania and Austin. He graduated from UT-Austin in 1951 with a Bachelors of Science degree in Petroleum Engineering. After graduation he found work as a rough neck in the oil fields of West Texas and Oklahoma. He worked for a short time in Bogota, Colombia. While in Columbia he purchased several emerald stones, one of which was later used for a very special purpose. After returning from Colombia, he landed a job with Carter Oil Co. in Tulsa, Oklahoma. It was in Tulsa that he met his beloved wife Polly and after a short courtship, asked for her hand in marriage, using a ring he designed with an emerald from Columbia. In June 1954 Dave and Polly wed in Tulsa. The first three of their five children were born in Tulsa; Sam, Ed and Julia. Dave and Polly remained in Calgary until 1983 when Dave, after retiring from Imperial Oil, was offered a job with Sirte Oil Company in Libya where he and Polly lived until 1986. Upon returning to Canada they purchased several hundred acres in south-central British Columbia where the 1994 Bossler Reunion was held. Over the next two decades they moved around living in places of extreme beauty in Western Canada and the U.S. before settling in Yuma, Arizona. 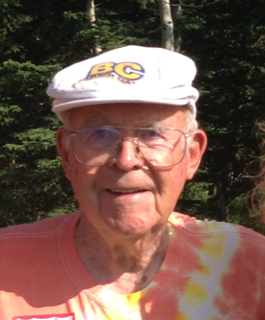 Dave had many passionate pursuits including fly-fishing, hunting, woodworking, lapidary and FOOTBALL! He was an avid rock-hound and enjoyed any project involving geology. Dave was always on the move and enjoyed traveling extensively. He never missed a chance to see a new place. Dave and Polly took many vacations together all around the world, visited countless countries saw many beautiful places. Polly preceded Dave in death, on October 12, 2008. Although travelling without Polly was not as enjoyable, Dave continued with his get up and go spirit, even embarking on a cruise from San Diego, California, through the Panama Canal and landing in Florida. Dave is survived and missed by his children: Sam and Linda Bossler of Calgary, Alberta; Ed and Lauren Bossler of Vernon, British Columbia; Julia Trim and Ken Cebryk of Calgary, Alberta; Dan and Mary Bossler of Chandler, Arizona and Mary and Dodd Lange of Round Top, Texas. He also leaves behind; eleven grandchildren and eight great-grands (and counting). His brothers; Robert Bossler of Bloomfield, CT and Bert Bossler of Buffalo, NY, and one sister-in-law; Clara Simpson of Garland, Texas. Or any charity of your choice. We are very sorry for your loss. After reading the obituary, we are sorry that we never got the chance to meet Dave. Our thoughts are with the whole family. It is always hard when you lose a parent or grandparent.